You would think after being on a trail 3 times in the past, that one wouldn’t have any trouble navigating that trail again (even though it was a year since the last time I was there). But here’s the thing, if a trail is not CLEARLY marked, I can easily take the wrong path. Today, surrounded by five fellow hikers, we took off for what should have been a short 3 mile round trip to High Rocks, in Wytheville, VA. Smiling with anticipation: Hannah, Peggy, Cindy, me, Jan and Sharon. Shortly into the hike, I felt like something was not right. It’s called Sand Mountain, because there is sand on the trail, presumably from sandstone rocks. So my first clue was that I didn’t see any sand. I also didn’t see a road that I remembered running parallel to the trail. And, though I do remember a lot of vegetation closing in on the trail, I did not remember all the thorny bushes that rubbed up against us as we walked on. Finally, at one point, I convinced everyone to turn back and try again. About half way back, we ran into 3 other hikers and we excitedly asked if they knew where the main trail was. Unfortunately, it was their first time and they were making the same mistake as we did. But they were young, and looked like they knew what they were doing, so we followed them. For a while, we took turns following each other, looking for the real deal. Jan, who came equipped with a phone app with GPS, could see our trail just to the left of where we were. But, there was no easy way to get to it. We had to walk through brambles, brush and all kinds of rocks and obstacles. Finally, after many detours, we made our way to the proper trail. I recognized it immediately and was so excited that we would not have to turn back without completing the hike. Yay, we made it!! Only took us a little over 2 hours and 1.5 extra miles. But it was fun at the top, and though I’ve seen it before, it’s still fun to hang out on the rocks. It was another beautiful, January day and I was so happy to be outside. The trip down was much shorter. When we got to the bottom we saw where we made our mistake. If you go there, from the parking lot, walk between the two boulders and then go to the LEFT! If the trail is not straight and you don’t see sand, turn around and try again. Don’t bother looking for tree markings, there aren’t any. For some reason, my “lost girls” were not discouraged. We had a great time and they talked about going out again. It’s always an adventure, and we always manage to get back home. So I guess I’ll get busy planning the next outing. Thanks to social media, word spreads quickly. You share pictures and a friend of a friend sees them and wants in. This is the case with my women’s hiking group, A.K.A. The Wandering Diva Striders. This week I met two new women who joined me and another relative newbie for a quick in and out on the Appalachian Trail. That’s Sharon, Jan, me, and Ruth! We started on Wilderness Road in Bland County and hiked North toward Dismal Falls. There was snow on the ground, clear blue sky, and though it started out a little cool, the temps warmed up considerably before the hike was over. We met two lone, through hikers, who were coming from the North – much respect to them for hiking the AT this time of year. They must have some very cold nights. Neither of them seemed to want to chat, so we just had to imagine their stories. Thanks to Jan for this awesome shot of the blue sky. She was breaking in her new (and first) smartphone. Looks like a pretty decent camera. It was fun hiking with new people and getting to know each other. One thing we all share is our love of being out in nature. It always amazes me how many women love to hike. Having a lot of names on my list, means I can usually find 2 or 3 who are available at any given time. A connector trail led us to the falls. If you are not a hiker, you can drive to the falls and view them from the other side. In fact JG and I had done that on Monday. It does offer a remarkable view. No matter what time of year, or how you get there, these falls are worth a visit! To top off the week, my feminist husband took me to Washington, D.C. to participate in the Women’s March. It was an incredible day, filled with energy and hope. Though nowhere near the crowd from last year, thousands turned out and there were some very inspiring speakers, including Virginia’s Senator Tim Kaine. What a week! From the trails to the streets, from winter cold and snow, to spring like temps, this year is off to a great start! For the past few years, the state parks in Virginia have been hosting a “First Day Hike” challenging people to come out and hike on January 1st. While we have done a couple of hikes at our own Claytor Lake, we decided to start off the new year with a hike at Hungry Mother. Located just an hour away in Marion, we decided to spend New Year’s Eve there in our favorite downtown hotel. There a lots of fun bars/restaurants in the area, including a very nice one located in the hotel. So off we went with thoughts of fine dining and partying without having to go outside (it was about 10 degrees). As we pulled up in front of the hotel, we got quite a shock looking into the windows of an empty restaurant. We discovered that 90% of the town is closed on Sunday!!! What??!! Okay, a normal Sunday maybe, but this was NEW YEAR’s EVE!!! After a small tantrum and a few cuss words, we realized there was nothing we could do about it. So instead of dressing up, we just hit the two places that were open and made the best of it. The sun beamed in our window around 7:30 and gave us hope that it would warm up for our hike. Ha! Mother Nature laughed at that idea. When we arrived at Hungry Mother, it was 14 degrees (F) -10 (C)! The lake was frozen, snow flurries were in the air, a pretty steady wind was blowing, but we ignored it all and off we went. This place is beautiful all year round. Even the dead rhododendron was pretty in its own way. 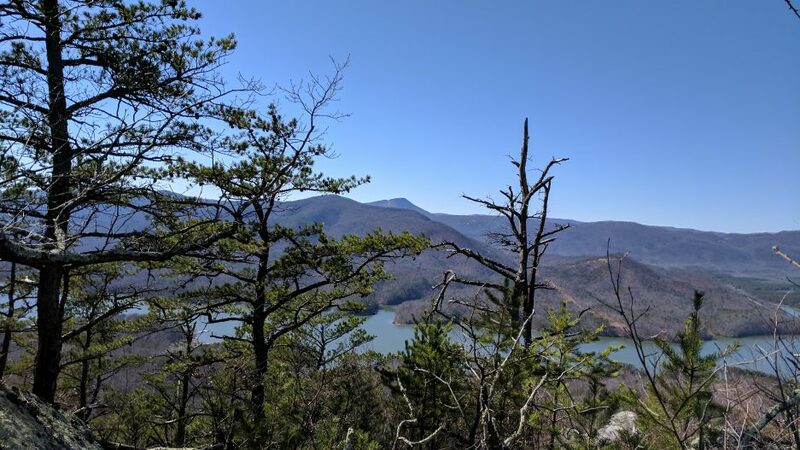 The original plan was to hike the 6 mile Lake Trail, but we modified that plan for the weather and ended up doing a 2.5 mile loop combo of the Lake trail and the CCC trail. Believe me that was plenty. What an exhilarating way to start the new year! I hope you all had a great “first day” too!